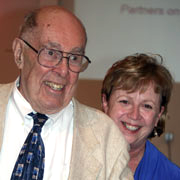 Duffy Health Center hosts a giving society in honor of Duffy’s co-founders Arthur Bickford, MD and Judy Best, Nurse Practitioner. The Bickford-Best Society is established to clearly recognize their generosity of spirit and concern for the well-being of all citizens of Cape Cod and to ensure that Cape Cod’s homeless and at-risk population continue to receive the care they deserve. "When we first worked together at the NOAH shelter, our primary goal was simple: to treat the clients we met with dignity and respect while caring for their unmet medical needs regardless of their ability to pay. We had no idea that our simple vision would develop into the daily philosophy of care at Duffy Health Center. Thanks to the dedicated staff at Duffy, our original model thrives to this day. For more information, please call Christina Wiseman: (508) 771-7517, ext. 169.